Creche meets on the 2nd and 4th Sundays of the month, aimed at pre-school and infant aged children. A parent/ guardian needs to accompany their child(ren) for this activity. We have Scouts, Cubs and Beavers meeting in the church hall on a Wednesday night in term-time. 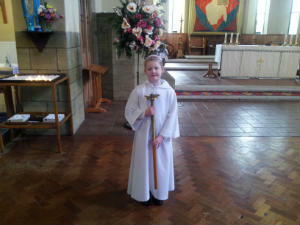 Older children are also encouraged to take an active part in our worship through serving as acolytes or singing in the choir.